Keeping up with Tiger Alumni at the next level and beyond. The 2016 Olympic Games in Rio de Janeiro, Brazil are well on their way. The Olympics are the highest honor for athletic excellence as an athlete – this is the best of the best. Athletes train for years to get to the Olympics, some even their whole lives. It truly is a remarkable feat. For two athletes, the journey may not have started at Saint Xavier High School, but it certainly provided a huge stepping stone on their path to the Olympic stage. Clark Burckle ’06 was a member of the nationally recognized Swimming and Diving team. Here, he was a four-time state champion (at the time these were the 15th-18th consecutive team titles). Also, he was an individual state champion in the 200 Yard IM, 500 yard freestyle, 100 yard breaststroke. He was a state champion on multiple relay teams, as well. On top of all these athletic achievements, he was also a National Merit Semi-Finalist. To say the least, he contributed a lot to the Tiger Sharks in his tenure. However, being a high school state champion was not his greatest goal. From St.X he attended the University of Florida from 2006-2008, but transferred to the University of Arizona for his senior year in 2010. At Arizona, he truly catapulted into the spotlight by becoming the National Champion in the 200 yard breaststroke. He was not done yet, though. Being apart of the National Team was something he had been dreaming of since he attended the 1996 Olympics in Atlanta. After missing the cut at the 2008 Olympic Trials, Burckle worked harder than ever. With another four years under his belt, it was his time to earn a spot on the Olympic team. “I was so nervous, I kept trying to tell myself it’s just another race, and I have some world-class competitors next to me and they’re going to take me to a fast time,” Burckle said to Louisville.com . He went on to place second in the race, .08 seconds ahead of the third place finisher, but regardless earning himself a spot on the Olympic Team roster. “I can’t even put it into words right now. It’s the epitome of what a swimmer dreams about.” Burckle said, after the race. Burckle currently lives in California as an aspiring businessman. He put his swimming career on hold while he attended Stanford’s Business School. Mike Silliman ’62 was a member of the last state champion basketball team his senior year at St.X. He was an honor roll student and also served as the senior class president. Coming out of Saint Xavier, he had 55 scholarship offers to play college basketball, being heavily recruited by the University of Kentucky. However, he made the decision to play for Bob Knight at West Point. Silliman, a 6’6″ forward, was a star at West Point. There, he was a three-year letterman in not only basketball, but also baseball. He has been considered by many to be the best all-around basketball player that Army has ever had. Over his four years, he averaged a double-double (22.2 PPG and 10.7 RPG). Silliman led the Cadets to three straight NIT semi-finals. When it was all said and done, he graduated as the most prolific scorer in Army basketball history, scoring over 1,300 points. Even more notably, this was done prior to the installation of the three-point line. Bob Knight has gone on to say that Mike Silliman was the best player he had ever coached. From West Point, he entered the 1966 NBA Draft. He was drafted by the New York Knicks, becoming the first and only player to be drafted from the United States Military Academy at West Point. However, he would hold off his NBA Career to serve in the military. While in the service he eventually achieved a rank of captain and served with the adjutant-general corps in Korea. Even during his military service, though, he found another way to serve his country: to participate in the 1968 Olympics Games in Mexico City. At the Olympics, Silliman was the captain of the team. His team had a perfect record, and went on to defeat Yugoslavia in the gold-medal game. This was the United States’ seventh straight gold medal in the event at the time. He went on to return to the NBA, but was traded to the Buffalo Braves. Unfortunately, his playing career was cut short by an injury, and he ended up playing only one season. Mike Silliman died at the age of 56 due to a sudden heart attack in 2000. After more than 40 years since his athletic career ended, he is still considered to be one of the best athletes to ever come from Louisville. He is apart of the Kentucky Athletic, Kentucky High School Athletic Association, Saint Xavier, and West Point’s Halls of Fame. Just recently in 2015, his jersey (#20) was retired at Army’s basketball arena. If he were still here today, I think many would’ve loved to see a 1 on 1 showdown between himself and another St.X basketball great Connor McKim. Lastly, though he is not an athlete, John Proctor ’91 will be joining the 2016 Rio Olympics Team as a diving coach. He is the head coach at Florida State University, and also the coach of Katrina Young. Young is a former Florida State diver who placed second in the diving competition from the 10 Meter platform. This earned her a spot on the Olympics roster. Proctor has quite the resumé as well, though. At Saint Xavier, he was a two-time state champion in the diving competition. From St.X, he went on to dive at Auburn University. Unfortunately, like Silliman, his career was cut short by an injury. Though Proctor himself will not be competing, we will certainly be cheering on his diver Katrina Young to win the gold medal. She will be competing on Wednesday, August 17th. To Clark Burckle, Mike Silliman, and John Proctor, we say thank you. Thank you for continuing the tradition of athletic excellence of Saint Xavier High School far beyond the years you all walked its halls. And thank you for showing the nation and the world, the prowess of the greatest high school in the world. Tonight is the NFL Draft! Who played in the league from St. X? We have posted this before, but in honor of this weekend’s NFL Draft I have put a list together of the Saint Xavier football players who have played in the NFL. The years next to the player’s name are the years they played in the NFL. Bernard Crimmins (G) – 1945 – Notre Dame. He played one year in the AFL at the age of 26 and scored one touchdown. From 1952 to 1956, Crimmins served as the head football coach at Indiana University Bloomington and was later inducted into the Indiana Football Hall of Fame. Robert Talamini (G/OG) – 1960-1968 – University of Kentucky. He played 8 years for the Houstan Texans and his last year in the AFL with the New York Jets. Talamini was a part of the New York Jet’s Super Bowl victory and started against the Ravens in their win in Super Bowl III. Samuel Gruneisen (C/G/LB/OG) – 1962-1973 – Villanova University. He played for the San Diego Chargers. After completing his tenure in professional football, Gruneisen coached at several levels of the sport. Maurice Moorman (OG) – 1968-1973 – University of Kentucky and Texas A&M. He played for the Kansas City Chiefs during the early days of the NFL. After winning the American Football League Championship with the Chiefs in 1969, he started for them in their victory over the National Football League Minnesota Vikings in the fourth and last AFL-NFL World Championship Game. Dicky Lyons (S) – 1970 – University of Kentucky. He was drafted in the 4th round (103rd overall) by the Atlanta Falcons. He is the father of former Kentucky and NFL wide receiver Dicky Lyons, Jr.
Kevin Lamar (OG) – 1987 – Stanford University. He played one year in the NFL with the Buffalo Bills. Kevin was a part of “The Play” when California ran back a kickoff to win the game and the Stanford band famously ran on to the field before the game ended. Lamar, a Stanford player who was in on the tackle, says that Garner’s knee had hit the turf while he was still in possession of the ball, but the play was ruled a touchdown. Christopher Sedoris (C) – 1996 – Purdue University. He played his single year with the Washington Redskins. Will Wolford (OG/OT) – 1986-1998 – Vanderbilt University. He was the Bills’ first-round pick in the 1986 NFL Draft, and played for them from 1986–1992, including AFC championships (and Super Bowl losses) in his last three years in Buffalo. Wolford signed as a free agent with the Colts in 1993, and finally joined the Steelers from 1996-98. He was named to the AFC Pro Bowl roster in 1990, 1992, and 1995. This upcoming season he will return to his alma mater and lead the Saint X football team onto the field as the head coach. Bernard Jackson (DE) – 2002 – University of Tennessee. He played for the Washington Redskins at age 22. He not only played football but was a center in basketball and won state titles in discus and shot put. In 1998, Jackson was a part of Tennessee’s National Championship. Joe Tronzo (FB) – 2010-2011 – University of Louisville. Joe played primarily on the practice squad for the Cincinnati Bengals and Tennessee Titans over 2 years. All of these players were fortunate enough to continue to play a sport they love and even after they graduated from Saint Xavier they made us proud. When the first round of the 2016 Masters begins on Thursday, Justin Thomas will be one of many newcomers that will walk down the fairways of Augusta National in what many call a tradition unlike any other. For Thomas, the journey to Augusta started 16 years before he won the CIMB Classic that earned him his invitation to this year’s Masters. In his hometown, Louisville, Kentucky, Thomas watched from the stands as one of the greats won his fourth Major in a row. The roar from 18 was heard all around Valhalla Golf Club and was heard by millions across the nation. Tiger Woods had just knocked in a par putt to defeat Bob May in the 2000 PGA Championship. While Tiger Woods was raising the Wanamaker Trophy above his head, a seven year-old Justin Thomas realized playing Golf is something he wanted to do for a living. Thomas isn’t looking to win his fourth straight major this weekend, but he is looking to make his first trip to the Masters a memorable one. His journey to the Masters didn’t start when he turned pro, but it has been something Thomas has been working towards since he started playing golf at Saint Xavier High School in Louisville, Kentucky. Just like golf was the perfect sport for Thomas, St. X was the perfect school for him. Thomas didn’t consider any other schools before deciding to go to St. X because it was “Tiger Tech all the way” for Thomas. St. X is expected to win tournaments and championships. During Thomas’ four year career, St. X brought home two state championships, and Thomas won one individual title. At State, Thomas finished tied for 13th his freshman year, 3rd his sophomore year, 1st his junior year and tied for 3rd his senior year with St. X winning the team title his sophomore and junior years. Thomas graduated from St. X in the spring of 2011 and took his talents to the University of Alabama. Thomas wasn’t intimidated by the college game at all. In his first year at Tuscaloosa, Thomas won National Freshman of the Year and National Player of the Year. He became the first Crimson Tide player to win his first career event and won the 2012 SEC Championship and the NCAA Athens Regional. In his sophomore year, Thomas and Alabama routed Illinois 4-1 in the 2013 National Championship and won the first golf national championship in Alabama history. After the national championship his sophomore year, Thomas had to make one of the more difficult decisions of his life. He had the option to bypass his last two years of college and become a professional. Thomas decided turning pro was the right choice for him. Thomas joined the Web.com Tour, and in his 20 events played on the tour, he placed in the top 10 seven times and won the Nationwide Children’s Hospital Championship. After one season on the Web.com Tour, Thomas earned his PGA Tour card after placing fifth on the Web.com’s earning list. Thomas was a threat almost every weekend, but he had some difficulty in finishing the win. Thomas had chances at the John Deere Classic, Quicken Loans National and the Frys.com Open to get his first PGA Tour win, but it wasn’t meant to be. His patience paid off on November 1, 2015 when Thomas won the CIMB Classic at the Kuala Lumpur Golf and Country Club in Bukit Kiara, Malaysia. Because of his win at the CIMB Classic, Thomas earned his invitation to the 2016 Masters. Augusta National is one of the best looking golf courses in the nation, and Thursday’s round will be Thomas’ first round at the Masters and his first round at any major besides the U.S. Open. What is Thomas looking forward to most at Augusta? “The opportunity to hopefully be walking up 18 with a chance to win,” Thomas said. The road to that potential walk for Thomas will start at 9:59 am on Thursday. Thomas is paired up with another first time Masters golfer in Emiliano Grillo and Dustin Johnson, who finished in a tie for 5th at last year’s Masters. The Masters presents an opportunity for Thomas to step into the national spotlight. Much of the nation knows him by “Jordan Spieth’s Good Buddy”, but will that be different after this weekend? Can he become the first winner in his first appearance since Fuzzy Zoeller in 1979? I guess we will just have to wait and see. In honor of Sunday’s Super Bowl 50, the NFL has sent golden footballs to every high school that has produced a player that has played in a Super Bowl. For St. X, 3 footballs were sent. They are currently sitting in the front hallway with the trophies. The three football players are Bob Talamini, Mo Moorman and Will Wolford. Talamini played in Super Bowl III with the New York Jets and defeated the Baltimore Colts 17-6 in Miami. Moorman played in Super Bowl IV with the Kansas City Chiefs and defeated the Minnesota Vikings 23-7 in New Orleans. Wolford played in three Super Bowls (XXV, XXVI and XXVII). The National Football League honors Saint Xavier High School and it’s role in developing and supporting the career of Mo Moorman who was part of Super Bowl History. Football has always been about more than wins and loses. The game teaches lessons that last a lifetime. Through your football program, your school is building men of high character by instilling values in your student athletes. The NFL is grateful to you and your community, and honored to partner with you in making champions on and off the field. Your school’s name will be listed on the Super Bowl High School Honor Roll. The Carolina Panthers and Denver Broncos will kick off Sunday at 6:30 ET in San Francisco for Super Bowl 50. Former Tiger Justin Thomas is a great golfer, and the national media is paying more and more attention to Thomas and his success on the links. Thomas is currently ranked 37th in the world and 5th on the PGA Tour’s FedEx Cup points race. Wednesday, PGA.com wrote a piece on Thomas and how he grew up in a golf family. With the PGA of America kicking off the celebration of its Centennial year at the PGA Merchandise Show, a lot of the talk this week is of the men, women and families that have lived the game down through the years. Among the more prominent golf clans at the Show is the Thomas family of Kentucky. Longtime PGA Professional Paul Thomas, now 84, is back home this week, but his son Mike, the head professional at Harmony Landing Golf Club in Goshen, Kentucky, and Mike’s 22-year-old son Justin were on hand Wednesday morning to take part in Titleist’s kickoff program. Another update on Thomas real quick. Justin Thomas is now the first PGA Tour Player that has signed with GoPro. Former Tiger Justin Thomas has had quite the first two rounds at the CIMB Classic in Kuala Lumpur, Malaysia. Thomas shot 68 on Thursday but followed that performance with an 11 under par 61 Friday. His 61 on Friday was a new course record with his nine birdies and eagle. Thomas currently is in the lead by 1 shot, as he sits at -15. Brendan Steele is in 2nd at -14, and Spencer Levin, Scott Piercy and Kideki Matsuyama are tied for 3rd at -13. Thomas will look to win his first tournament of his pro career on the PGA Tour on Saturday and Sunday. 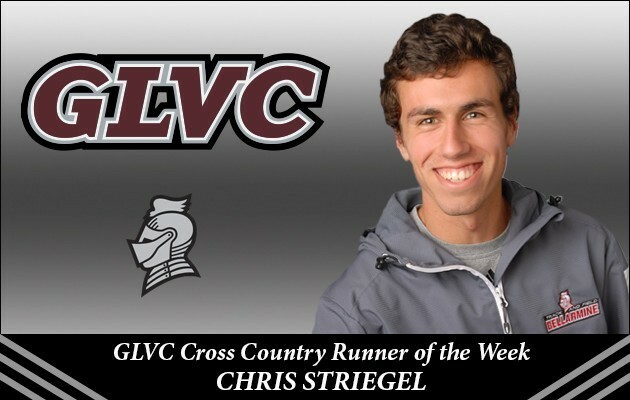 Former Tiger XC runner Chris Striegel was named Great Lakes Valley Conference Runner of the Week after his second place finish at the Notre Dame’s National Catholic Invitational. The meet was full of Division 1 runners and the Bellarmine Knight only followed one runner in the 8k race with a time of 25:00.2. “He showed he will be a major force in the GLVC and D-2,” said Jim Vargo, BU’s director of cross country and track and field, after the race. Striegel transferred from the University of Louisville last year, and he led the Knights to a runner-up team finish in the College Division. Striegel and Bellarmine’s next race will be on October 3rd when they participate in the Greater Louisville Classic. Justin Thomas, PGA Tour Rookie of the year? Former Tiger Justin Thomas has had one heck of rookie season on the tour. Thomas has made the cut in 22 of the 29 events he has played in, has had fourteen top 25 finishes and has finished in the top 10 seven times. Fansided web site Pro Golf Now broke down the race between Thomas and fellow rookie Tony Finau. With the year coming to a close some hardware will be given out. Some of them are statistics based and some have pretty much been wrapped up already. One award that is still up for grabs, however, is the PGA Tour Rookie of the Year. This has been an interesting race from the start as we have had a really talented class. As the season has progressed it has become a two horse race between Justin Thomas and Tony Finau. Both are worthy enough to be recipients of the 2014-2015 PGA Tour Rookie of the Year, but who has the inside track with two events left? It’s an interesting question and when you take a look at their respective resumes, as of the Deutsche Bank Championship, there is no wrong answer. It is a razor thin race. Go check out the rest of the article by clicking here. Roesler recorded 3 tackles and 1 for loss in the Razorbacks opening game of 2015. He should see time again this week against Toledo. The Colonels went on the road and blew out Hanover where Former Tiger Jake Johnson recorded 3 receptions from the receiver position and on defense, Kyle Oliver and Alex Mattingly both had 1 tackle. Clyburn saw good time in the home opener for the Rams and recorded a tackle in their big win over Savannah State. They take on a very good Minnesota team that just went toe to toe with the #2 team in the country last week. Askin started his first career game for the Panthers in their week one loss. Stephens saw time on special teams for the Gators in their big win over New Mexico State to open the season. Schickel recorded his first two career field goals (22, 27) for the Greyhounds in their win over Saginaw State. Brad also punted 3 times for 86 yards. Walker made one of the biggest plays of the game for Kentucky in their win over UL Lafayette as he caught a pass across the middle and dove within inches of a first down to set up a game winning drive for the Wildcats. Coach Stoops and quarterback Patrick Towles praised Charles’ toughness and play making ability after the game and in interviews this weekend. Smith had a 9 yard reception in the big win over Lyon for the Blue Raiders. Gahafer started and went 18-31 for 173 yards in the Eagles loss on the road. Phillips started at RG for Morehead State as well. Stone assisted on 1 tackle in the Lumberjacks’ loss last weekend. This week, George and his team will face a huge test in TCU who is on a mission for an undefeated season. Let’s keep an eye on the Former Tiger to step up on the big stage! Collins punted once in the Hilltoppers upset over Vanderbilt on the road. Tiger Football kicked off their season last weekend and now it’s time for a lot of Former Tigers to begin their seasons here in the next couple of days. Below you can find an extensive list of Former Tigers that are now playing at the next level along with game times and television coverage along with a little commentary. Some will be playing on national television, but if they’re not, we’ll keep you updated weekly on how each and every one of your favorite college football players are doing. Good luck to all the Former Tigers in the opening weekend of college football! Football is back! As a redshirt freshman, Roesler played in two games and recorded a total of three tackles last season. Two of those came against nationally ranked Georgia in Week 7. Centre is ranked No. 22 in the D-III Preseason Rankings heading into the 2015 season. Clyburn recorded 20 tackles last season for the Rams and will be a major contributor in his junior season this year at the mike linebacker position. Up to 230 lbs., the Former Tiger is ready to make a big step forward under new head coach Mike Bobo. Stephens was recently awarded a full-scholarship after spending two years as a walk-on for the Gators. Garrett was scout team player of the year last season and has shown all the characteristics of a great teammate which was recognized by the new coaching staff and head coach Jim McElwain this summer. Walker saw a lot of early time for a walk on wide receiver as a true freshman, but the Wildcats loaded up on the wide out position in their recruiting class and are returning guys that were redshirted a year ago. According to reports, he had a great fall camp while running with the second team a lot. We’ll have to wait and see how his new offensive coordinator Shannon Dawson wants to use the Former Tiger. Charles recorded two tackles on special teams in 2014, so #88 should be seen a lot in the third phase of the game. Gahafer was named Honorable Mention All-Pioneer Football League and Pioneer Football League Co-Offensive Player of the Week once. He completed 288-of-451 for 2,840 yards and 23 touchdowns in 2014, which ranked second in the conference in total passing yards and yards per game. Gahafer posted eight games with 200+ yards and three with 300+ yards and threw a career-best five touchdowns in the Eagles’ home opener versus Pikeville. He was also named to the PFL Academic Honor Roll a year ago. His fellow Former Tiger teammate, C.J. Phillips was a member of the PFL Academic Honor Roll as well. Phillips started all 12 games for the second straight season in 2014 and helped the offensive line rank second in the Pioneer Football League in fewest sacks allowed. Stone is listed as the backup Mike Linebacker heading into game one after transferring from a California Junior-College to play for the D-III Lumberjacks. Former Tiger Justin Thomas finished tied for 16th at -5 at The Barclays this weekend in the opening round of the FedExCup Playoffs. Thomas shot a fourth round 3-under par on Sunday. Thomas earned 214 FedEx points for finishing tied for 16th which puts him in 30th in the FedExCup rankings going into the Deutsche Bank Championship in Boston next weekend where the top 100 golfers in the world will square off. The Playoffs feature a progressive cut, beginning with The Barclays in the New York/New Jersey area (125 players), continuing with the Deutsche Bank Championship in Boston (100 players) and the BMW Championship in Chicago (70 players). A reset takes place, seeding the top-30 players for the culminating TOUR Championship by Coca-Cola in Atlanta, where the FedExCup Champion is crowned. Anyone up for a road trip to Boston? Former Tiger Justin Thomas has had an impressive rookie year on the PGA Tour and earlier this week he was put on the cover of the 2015 Summer issue of The Tiger. Q: Tell me about your daily prepration habits. A: It depends on what I am doing. If I have a week off, I’ll try to sleep in because sleep is so important. I follow it with breakfast and a workout, then practice or play most of the day and then try to wind down at the end. Mostly I just try to find a way to get better at something each and everyday. Q: Do you have personal goals set, and how do you measure these? A: I do, yes. I keep them on my phone. I made them at the beginning of the year. I just keep practicing to become the best I can and keep working my way up to trying to become #1 in the world.